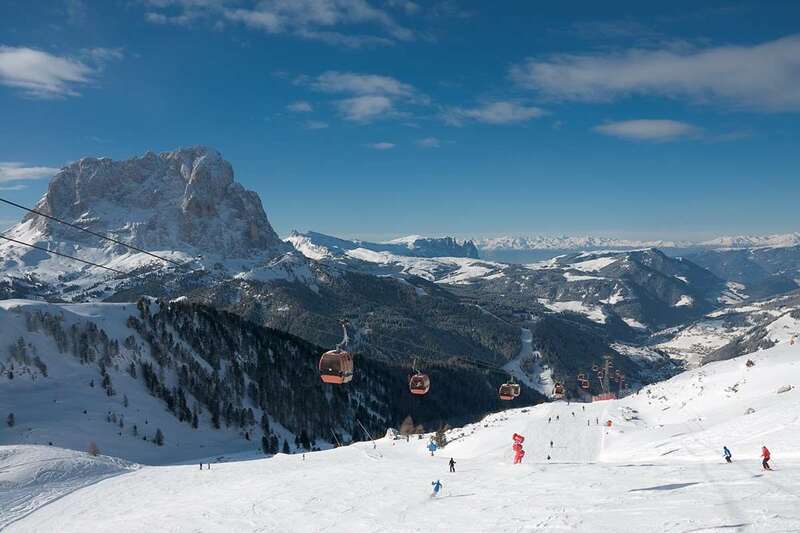 This friendly family-run hotel, close to the main gondola, is an enchanting mix of traditional Val Gardena style and modern facilities. The Linder is a perfect place to base yourself if you like to relax and feel looked after thanks to its lovely staff. Free use of the pool, sauna, Turkish bath and jacuzzi at the Hotel Nives, 5 minutes’ walk away. All have bath or shower, balcony, satellite TV, telephone, radio, hairdryer and safe. Weekly buffet of Italian cheeses and weekly Tyrolean gala dinner. My oldest friend and I spent a week at the Hotel Linder and thoroughly enjoyed everything. The bedrooms (small doubles in single occupation) were plenty big enough for one and the storage space immense. Bathrooms were modern and functional, the bar area spacious and attractive, the ski room well designed and the staff unfailingly helpful. The position opposite the Ciampinoi bubble was ideal, except for the first 50 m of descent to the road which was a little slippy whilst carrying skis. The major extra points were the food, excellent both at breakfast and dinner and the constant evidence of the family doing its best to make life easy for guests. In &quot;family&quot; I include many of the empolyees who praised their employers for looking after them so well. Slight demerit for the sauna - always full - and the psychological barrier of having to go out after a hard days skiing to use the superb pool and spa facilities in the sister hotel not really surmounted by the provision of a kit bag with robe, towel and slippers to carry over there. At our age apres-ski is not a factor but your programme insists that I give it a vote, so I have done so based on what I heard from others.